Luigi’s Mansion: Dark Moon on the 3DS is the second Luigi’s Mansion game and the first on a portable console. 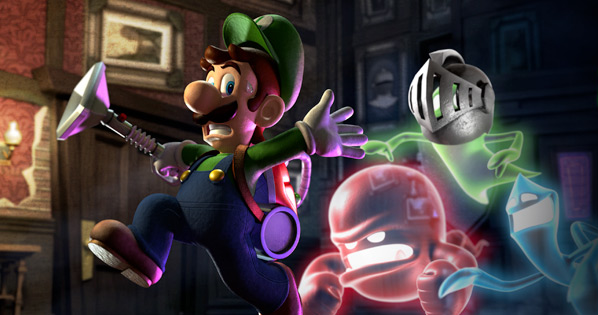 The original Luigi’s Mansion was a launch title for the Gamecube back in 2001 that holds a lot of fond memories for me. The Gamecube’s launch was the first console release I was old enough to really appreciate, so I had high hopes for Dark Moon. Unfortunately, the changes from the original left me feeling disappointed. 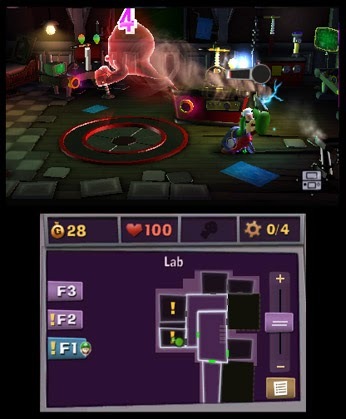 As in the original, Luigi’s Mansion: Dark Moon sees you controlling Luigi, the younger and less famous Mario brother. 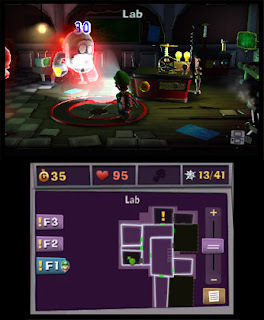 Luigi is called to Evershade Valley by Professor E. Gadd to assist in recovering the shards of the titular Dark Moon, which has a pacifying effect on the ghosts of the valley, but has been shattered by unknown forces, leaving the ghosts wild and out of control. It’s a simple enough set up, but the story can’t seem to decide whether it wants to just be an excuse to send Luigi ghost hunting or whether it wants to take focus, and what we’re left with is a simple and predictable story with far more dialogue than it needs. The dialogue was actually the biggest problem that stood out to me. Whatever lingering affection you might have for Professor E. Gadd from the original will be eroded away as you proceed through Dark Moon. He will call you up for every trivial thing to let you know what’s happening and what you need to do. There’s a well known rule in writing: show, don’t tell, but it seems that the writers of Luigi’s Mansion: Dark Moon forgot this rule because the game just outright tells you everything. Go here. Do this. Catch this ghost. Find this key. Part of the blame for this can be laid on the game’s mission structure. There are several mansions to explore, and each one has multiple missions to complete. 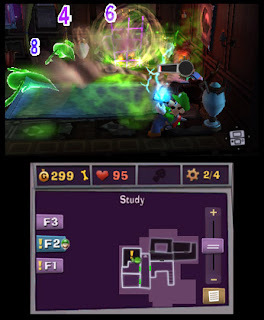 In each mission, Luigi is teleported into the mansion, completes some task, then is teleported out. Before and after each mission, you’ll need to listen to the professor yammer on about what you’ve been doing and what you’re about to do. He never says in one word what could be said in twenty, and his endless exposition doesn’t contain itself to pre and post mission briefings, either. He’ll call you up during missions as well, and he never makes things brief. The constant interruptions break the flow of gameplay in ways that go beyond simple annoyance and into outright frustration. This is all made worse by the aggressive hand-holding. The game doesn’t think that you’re smart enough to figure out its uninteresting story, so it spells everything out for you in the most obvious terms. It frankly gets to the point where it’s insulting. It's a shame because the core gameplay is actually quite solid. You travel from room to room, using your ghost-catching vacuum, the Poltergust 5000, to round up troublesome ghosts. There’s a real investigative element to gameplay as you explore the mansions. Hidden ghosts and collectible gems give an incentive to go through each room with a fine-toothed comb and reward attentiveness to detail. Searching for all of the mansions’ secrets is a real joy. It’s just a shame that it keeps getting interrupted by E. Gadd’s endless dialogue. The very mission structure itself rails against the most interesting elements of gameplay. Most missions are short and linear, removing much of the fun of exploration. Furthermore, at the end of every mission, you are given a rating, which rewards completing the mission quickly, finding lots of treasure, and minimizing damage taken. The incentive to finish quickly in particular is at odds with the game’s core of exploration. You’ll want to make a slow, methodical search of the mansions, then get slapped with a poor rating at the end of the mission for taking so long. In brief, it feels like all of the game’s problems can be tied back to the mission system. Were the game simply a series of mansions to explore, each one filled with ghosts and secrets, then the whole thing would have flowed much better. Funnily enough, what I’ve just described is how the original Luigi’s Mansion was structured, and I feel that that game was far superior because of it. Dark Moon polishes some of the gameplay of the original, but the mission rankings, the dialogue, and the fact that you get pulled out of gameplay at the end of each mission are just too aggravating for me to really recommend Dark Moon. There’s some excellent gameplay to be had at the core, but everything built around that core detracts from it. An ill-advised mission system and clunky dialogue degrade what could have been a great experience into a mediocre one. I hope your reviews arent as bad as your Lol play. Moron.